Zurich/Cape Town. New Apostolic choirs in South Africa are well known for their excellence in music. 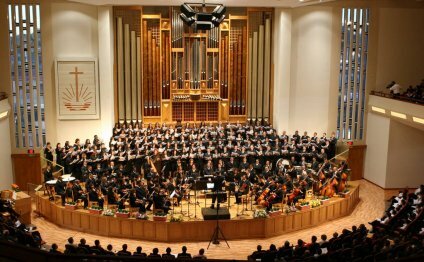 On Pentecost Saturday, 22 May 2010, interested music lovers will be able to judge for themselves: at 5:00 PM local time, the Cape District of the New Apostolic Church will transmit a concert around the world via satellite from the Silvertown music auditorium. The concert program incorporates arias, choir hymns, classical music, and folk music. The auditorium in Silvertown offers seating for 1, 600 people, and has been specifically constructed to accommodate larger concerts. The District Church of Cape Town has already produced several DVD and CD recordings here, including some in cooperation with the Cape Town Philharmonic Orchestra. The Pentecost concert will feature performances by the choir and orchestra of the District Church, along with a children’s choir and several soloists.